What started as an effort to remove trash on a North Carolina creek became a vision to correct decades of environmental racism and oppression. The story of Walnut Creek isn’t just about a river coming back to life — it’s about a community reclaiming its voice. Tiny and meandering, the creek flows through a cluster of urban neighborhoods in southeast Raleigh, North Carolina, before joining up with the Neuse River. Developed during segregation in the 1950s, southeast Raleigh was the city’s first planned neighborhood for African Americans. Racism made its mark in significant ways. Developers also neglected to tell new residents that they were moving into a floodplain. Every time a big storm hit, Walnut Creek became a massive torrent, swamping people’s homes and businesses with water. Over the years, the city sidelined citizens’ requests for help and instead invested in affluent communities’ education, recreation and green spaces. Walnut Creek became like so many other urban rivers: eroded, polluted and littered. Without any reason to feel pride in Walnut Creek, citizens lost their connection to the stream altogether, seeing the overgrown and littered wetland as a nuisance. Some residents didn’t even know it was there. Over time, indignation toward the city hardened into distrust. In the late 1990s, a group of parishioners at the St. Ambrose Episcopal Church envisioned a way to bolster the community’s spirit: clean up Walnut Creek. Getting rid of tires and other litter created positive momentum and spurred conversation about how to solve other problems in the community. The group organized and, for 15 years, advocated for the creation of a dedicated educational park, which opened in 2009. Just a mile from downtown, the 58-acre Walnut Creek Wetland Park provides wildlife habitat and flood relief to nearby homes. It’s also a hub where local people can learn about and connect with the environment in their own backyard. Southeast Raleigh’s spirit of activism had awoken, but flooding still plagued the community. Skeptical that the city would help, residents searched for alternative solutions. 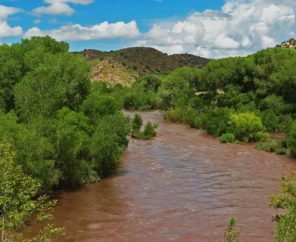 Reverend Taylor and other community members started talking with scientists at North Carolina State University, which sits upstream, and Peter Raabe, who leads American Rivers work in North Carolina. 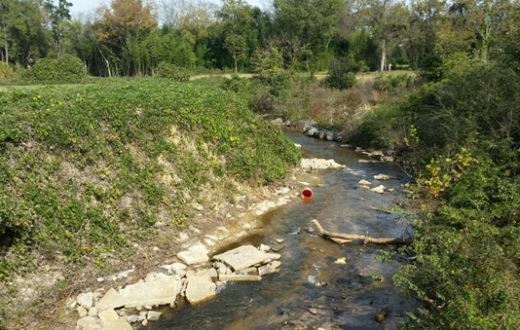 Raabe saw an opportunity for American Rivers to help the community build on their progress and improve the health of the entire Walnut Creek watershed. For a year, he attended meetings and simply listened. 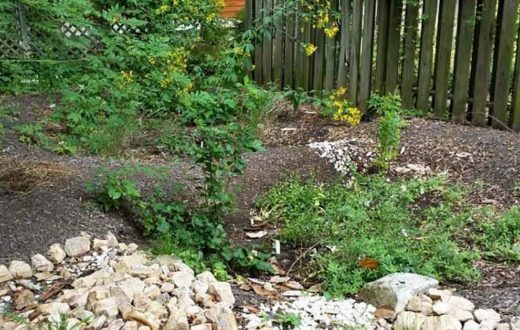 When the idea for a rain garden arose, he saw his opening. 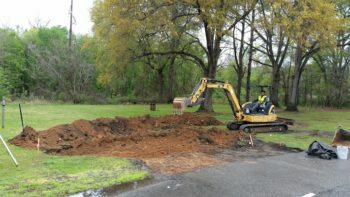 American Rivers gave a $10,000 grant to kick start development of a rain garden at St. Ambrose Episcopal Church. A rain garden is a natural area of rocks, plants and soil that captures excess water in a depression. 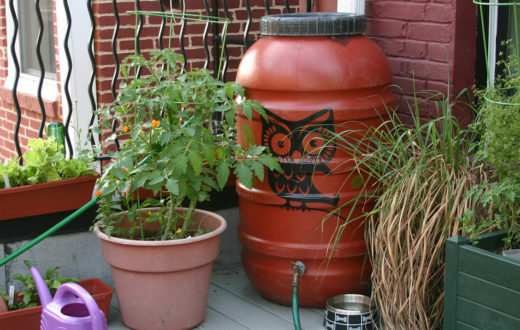 It is an inexpensive, natural way to filter out pollution, keep extra water out of overburdened storm pipes and add beauty to a community. 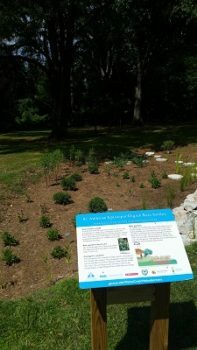 By leveraging the grant from American Rivers, St. Ambrose secured matching funds from the city of Raleigh, allowing the church to double the size of the rain garden. Throughout the whole process, the church community was heavily involved — choosing the location and participating in the design and construction. Completed in April 2017, the 550-square-foot rain garden captures rainwater from the parking lot and lets it soak into the ground rather than flooding. Reverend Taylor acknowledges that the community can’t “rain garden itself” out of decades of injustice. 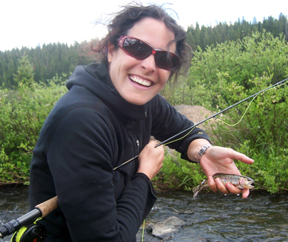 Since the initial grant, American Rivers has supported other ways to engage local people around solutions. Raabe has directed grants for community focus groups to provide a forum for discussion and sharing. 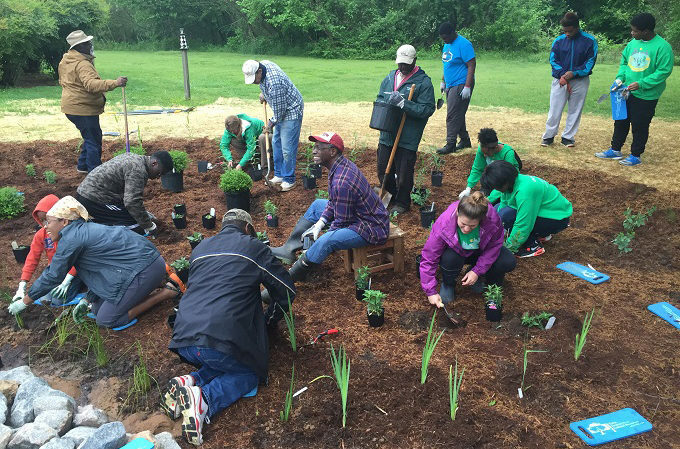 And recently, a local group called the Center for Human-Earth Restoration used an American Rivers grant to host a workshop for middle school and high school students to learn about rain gardens and other natural ways to manage flooding. The students presented what they learned to their parents, some of whom expressed interest in having rain gardens installed at their homes. To plan for the future, American Rivers is helping create a watershed map to show city planners how Raleigh’s population and building boom affect the historically marginalized communities living downstream. No respect for those that allowed such a horrific injustice, are they just so blind they actually ruin their own environments, intelligence level must be very low. Very sad and it really brings tears that they would even consider doing anything like this. Unfortunately that’s how racists think to do things but it bites them back in the end. Foolish and childish ways that call themselves better than the rest of us. They do things on much smaller scales housing, sales sad. Wonderful! Rain gardens are so important in these times of pavement. Thank you all for these positive steps. How many rain gardens do you have?